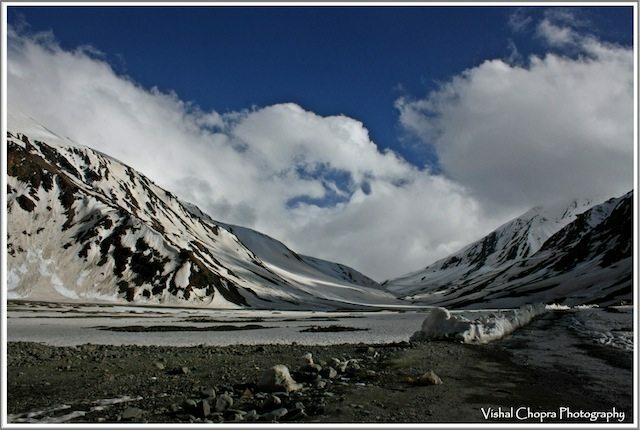 Ladakh Calling... (Part 2) - Manali to Sarchu - Ghumakkar - Inspiring travel experiences. 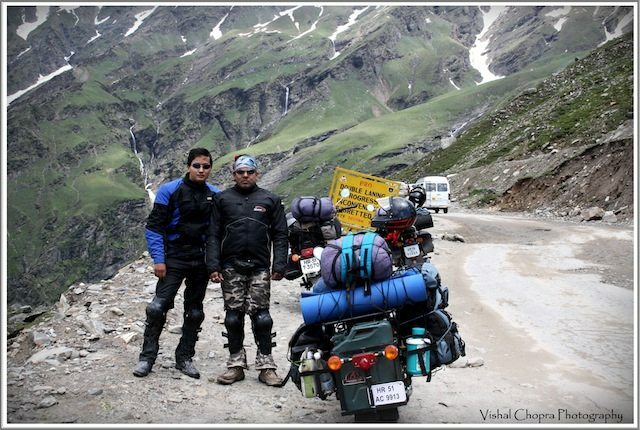 We approximately covered 600Kms & we all knew that the easy part of our journey is over. Next morning we were all set & excited for our onwards journey into the unknown & for the surprises the day had for us in the package. 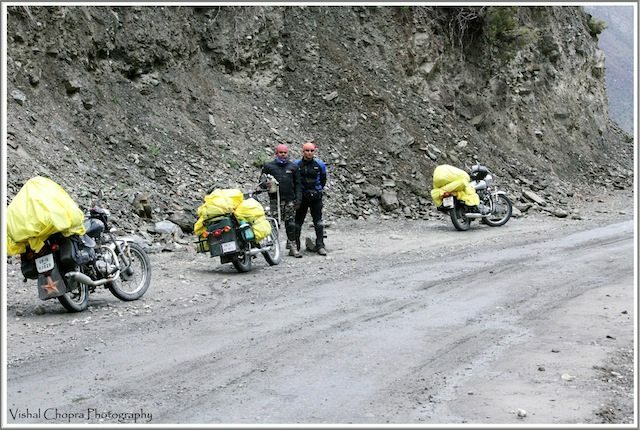 We started at around 10:30 Hrs from Manali which was a late start as per locals. But who was in hurry? Not at least us. Our entire trip was an open itinerary from Day 01 without any targets or deadlines to meet. 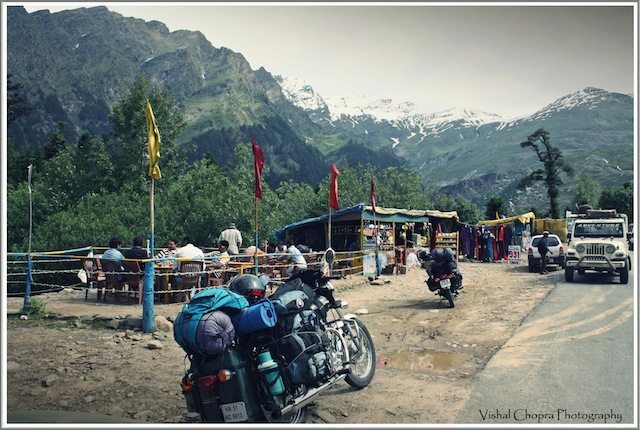 We geared up to make our contact with the first mountain pass of our journey – “Rohtang Jot” “Jot” in Himachali means “Pass”, @ 13044 ft. above sea level. The moment we crossed Manali we got stuck in the terrible traffic jam close to Mahri. We encountered dreadful traffic on the narrow curvy roads & after lots of efforts we somehow managed to cross the congestion & took an advantage over the crowd & early flyers. We covered a good distance & left the crowd behind in that jam. After crossing “Mahri” we stopped for breakfast. Here we had the first sight of beautiful snow peaked mountains. We quickly filled up our stomachs with hot Maggi coupled with double dose of hot tea & we were off to avoid the congestion again. Initially, we were focusing on the road & the traffic but suddenly we realized we had gain altitude with some steep inclines & the atmospheric pressure started shrinking with less oxygen levels. Here is the first view of the Snow caped mountains. 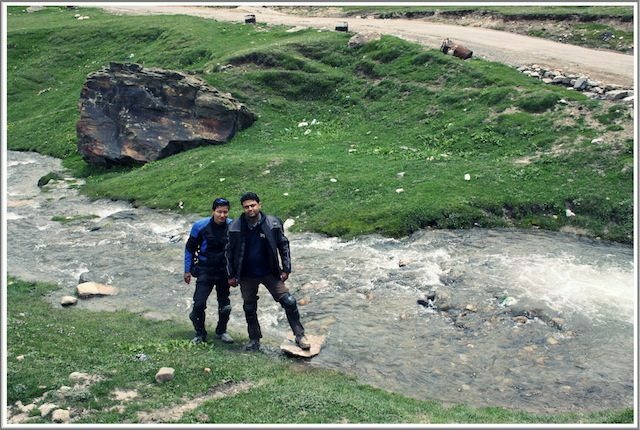 Soon we reached Rohtang Top and after few clicks & lot of “mastibaazi”, as evident in the photographs above, we started our downhill journey to “Koksar”, a beautiful small green village, located at the foothills of Rohtang on river “Chandra”. Not many tourists travel beyond this point as they normally go back from Rohtang top and this is where one actually leaves the crowd behind. Ask any seasoned rider & he will explain how difficult it is to go on a downhill journey with fully loaded bikes on a muddy track complemented with glacial melts. It took lot of time & energy wrestling with melted snow, slush, water crossings, huge boulders on way & lengthy patches of mud (approx. 3ft high & 100-150 mtrs. long). It was a real test of strength & a challenge for all of us to control our loaded bikes in the mud & at the same time maintaining ourselves on the saddle. Finally, our dear “Rambo Rawat” lost control on his bike & met his first fall deep inside the mud. A fellow biker on the way helped him out. We all shared a laugh on the 1st fall of our trip in our next break. We continued towards “Koksar” & after all the action & workouts we reached there by 14:30 Hrs. & had good fresh lunch (Daal Chawal, roti Sabzi) on a decent dhaba. The fresh cooked food with hot chapattis was like the best cuisine ever on a remote place like “Koksar”. The Dhaba owner’s little “rosy cheeks gal” was very friendly with us despite we being strangers to her. She posed in the most sophisticated manner in front of our camera flash. We spent some time with her & asked the Dhaba owner about the road condition ahead. It was already 16:00 Hrs & we had our doubts crossing “Sissu Nalha” also known as “Pagal Nalha”. He advised us to avoid the main route & take a bypass route, which means an extra 04 Kms distance. A group of bikers on their return journey also confirmed about the same. We were slightly tensed with the statements but thought to have a look at it even if we will not cross it. We came back from the main crossing of “Pagal Nalha” & took the bypass road by taking the uphill diversion to avoid that terrible flow. We reached to a point where the flow was at just a little faster than the manageable speed. Again our courageous “Rambo Rawat” met a fall almost at the end of that crossing. Before we set out for his help a biker from the other side came to his rescue. 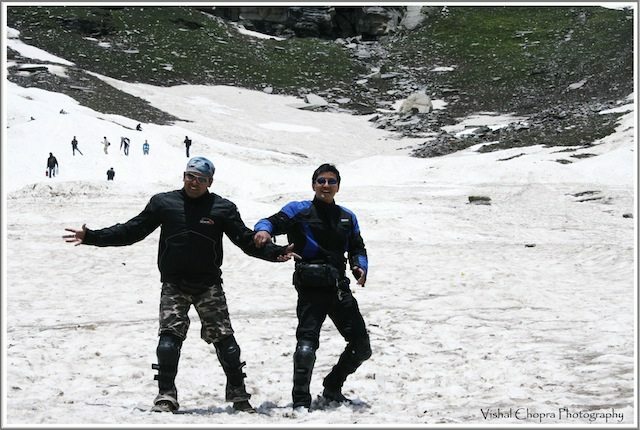 Deepak, fully packed in his riding gear, got fully soaked in that glacial melt but still managed to have a laugh. Crossing that flow was not that easy but Deepak made it look easy for all of us as he guided us all the way in his drenched clothes standing in the middle of that flow. On his request I deleted that particular photo of his fall. Again we got a topic for discussion & laughed it out loud. Few more bull riders joined us at the other end & they were feeling a little scared seeing the condition of our “Rambo”. 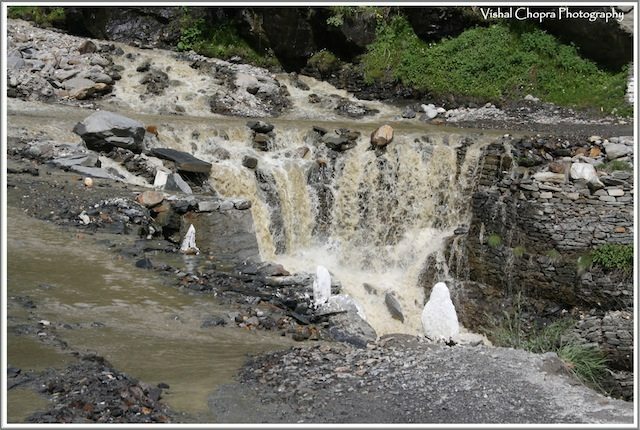 Without any second thought Deepak decided to help them cross that flow. He was standing in the middle of that rivulet guiding them with the direction along with some words of courage as he got the fair idea of the depth & flow. He wanted to show the same gesture & spirit as shown by the other bikers on the way. It was 17:00 Hrs & winds were freezing cold but still Deepak, in all wet condition, stayed there in the middle helping them all crossing the deepest & the toughest point of that flow. His spirit & efforts were appreciated by all the other riders. We had a small break celebrating our success & efforts of Deepak which also gave him some time to change his dripping clothes. 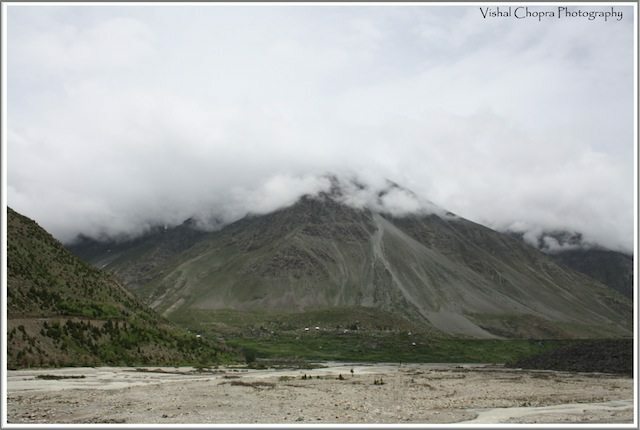 On our way to day’s destination – “Keylong” we crossed small villages like “Sissu” & “Tandi”. 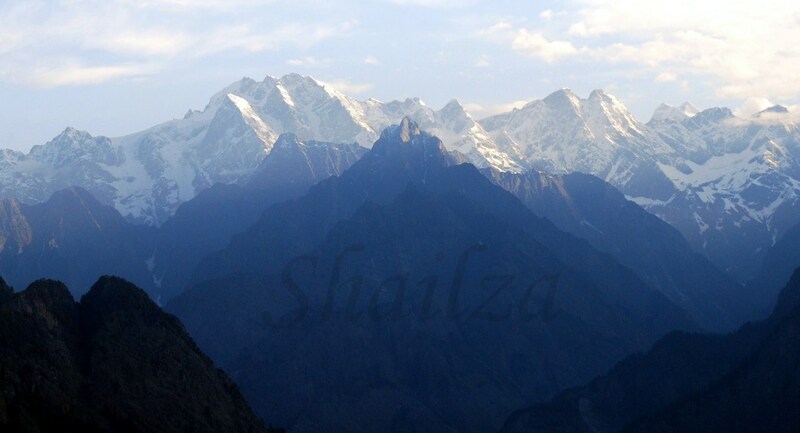 There are some treks which start from these places. Tandi – A small village at the confluence of Chandra and Bhaga rivers. There is a mythological story attached to these rivers. Chandra – daughter of the Moon and Bhaga – son of the Sun god. To perform their eternal marriage, they decided to climb to the Baralacha-la and from there they ran in opposite directions. 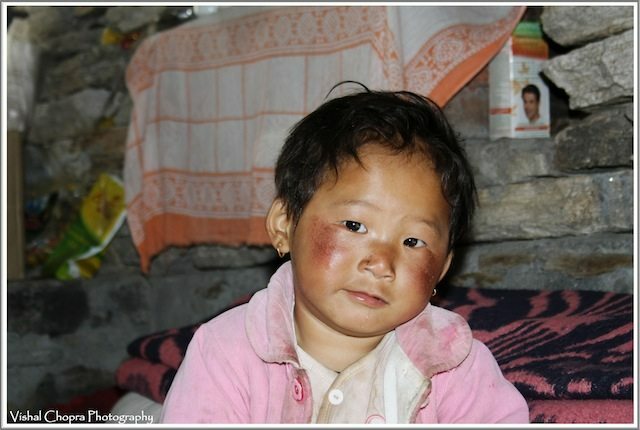 Chandra being active and smart easily, found her way and reached Tandi. Soon Bhaga was found coming with great struggle through the narrow gorges to Tandi, where consequently both met and the celestial marriage was performed. 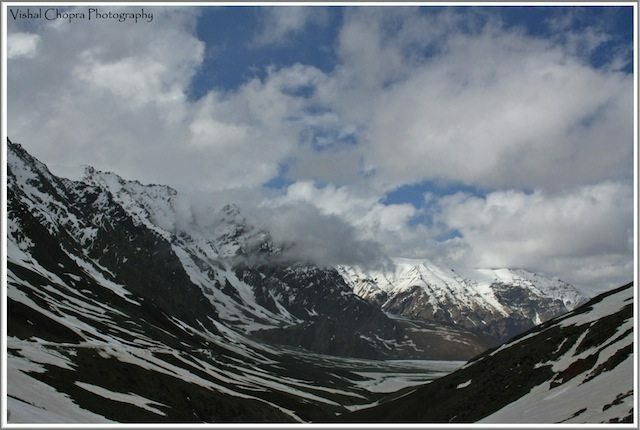 The two great rivers of Lahaul, The Chandra and The Bhaga, arise from the huge snowfields on opposite sides of the “BarlachaLa pass”. On the North West lies the Bhaga River while the River Chandra flows from South East. 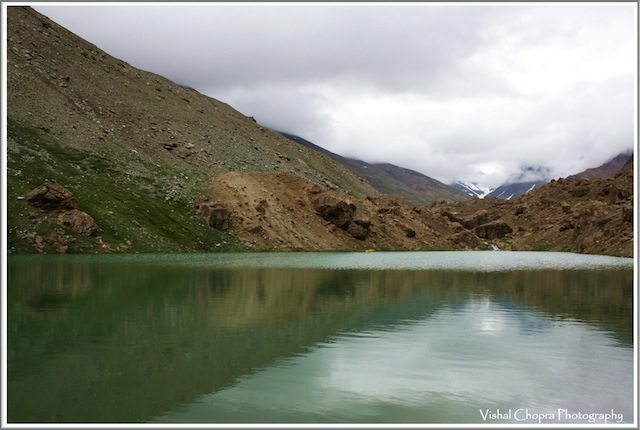 Baralacha-la is also having a beautiful lake called Suraj tal (Sun lake), the source of the river Bhaga. Road to Keylong and Udaipur bifurcate from here. Tandi is also known for the last filling station. 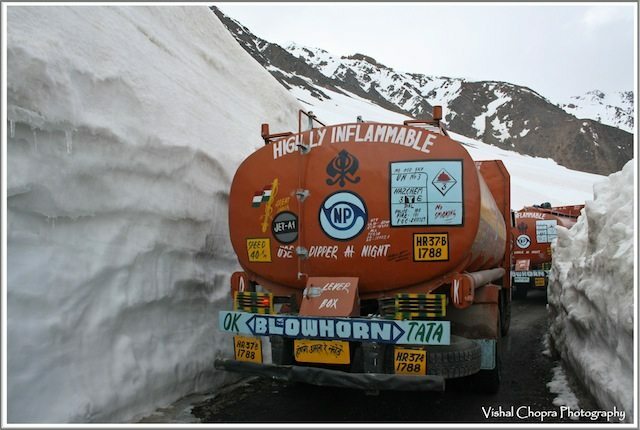 All vehicles travelling on Manali – Leh highway tank up their vehicles & carry some extra petrol or diesel as per their mileage. 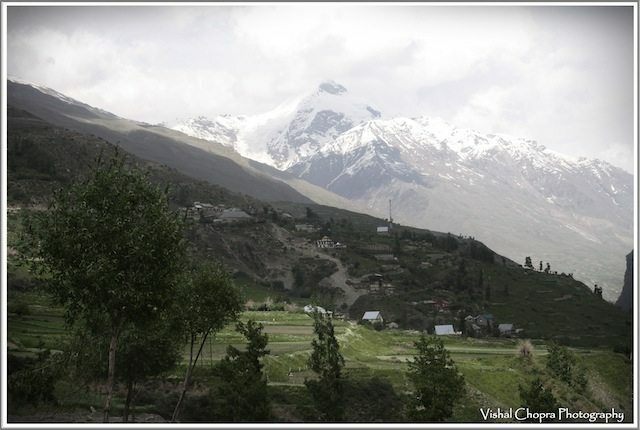 Keylong, a scenic landscape surrounded with snow peaks & lush green mountains is located on the banks of river Bhaga. 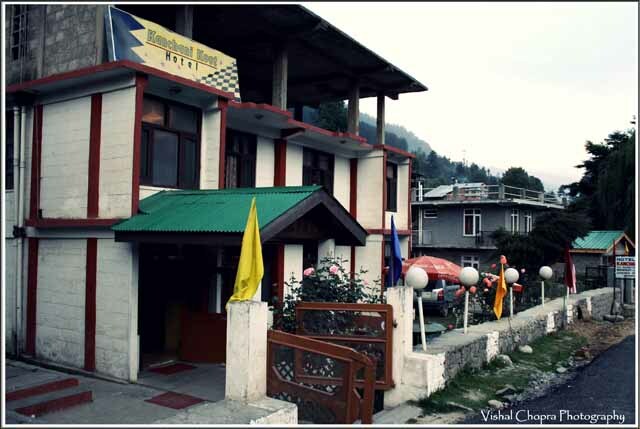 Keylong, the only major town on Manali-Leh Highway had less luxurious but concrete hotels and guest houses. We took a small room in the heart of the town at a cost of Rs 450/- only with all the facilities like hot water, fresh food with room service & wall to wall carpet. As per our routine we started our evening with B.P (Blenders Pride) & ordered a full Chilly Chicken. To our surprise we got “desi murga” prepared in local spices. The quantity was like too much for 2 to finish with a price so reasonable. It came up around Rs 180/- only. Surya, a pure vegetarian by choice, ordered some Panner tikkas. We spent our entire evening relaxing with small doses of B.P with special flavors offered to us by that small town. We discussed about our next day’s target, “Sarchu”. A little late in the evening Rain God greeted us in “Keylong”. 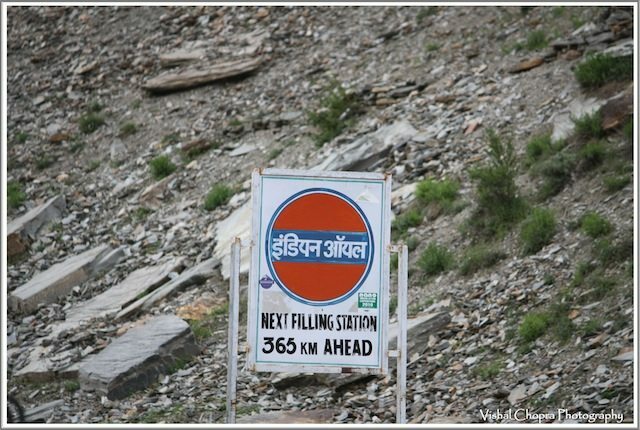 I was a little concerned & apprehensive for our next day’s target considering the weather conditions at “Barlachala Pass” which is at a height of 16,500 ft above sea level. We were praying & singing the age old rhyme in our way “rain rain go away… don’t even dare to come in our way, we all three want to go to LEH”. Surya & Deepak on the other hand were very positive with the plan of doing & achieving “Barlachala” on the very next morning itself as they were sure that weather conditions will definitely improve. With this YES NO discussion we went off to sleep. Our bodies rested there for 8 hrs but our brains were fully engaged with the thought of achieving “Barlachala”. Next morning I was up @ 05:30 Hrs & dived out of bed to see some positive signs of relief but the scene was frustrating & heart breaking. The conditions were totally overcast with little rain. Few Peaks were not even visible & were fully covered under the mist. On the other side of Bhaga River some mountain tops received fresh snowfall in the night. The early morning scene was disturbing but was good enough to start the morning discussion between 3 of us. I also called up Paahji (Anand) for weather updates but the response was not very motivating. At the end both, Surya & Deepak, managed to convince me to go ahead with the plan. By the time we decided it was 10 in the morning. As a part of our daily routine we did our regular exercise of loading the entire stuff on our bikes & also arranged for some rain cover to protect our luggage in case of heavy rain. The day was a holiday at Keylong, not sure about the reason why & the market was not fully operational but somehow we managed to get a decent breakfast of “Chole bhaturay” at a small shop. With all the nervousness and doubts in mind we started with a great thump & with a heart full of courage. 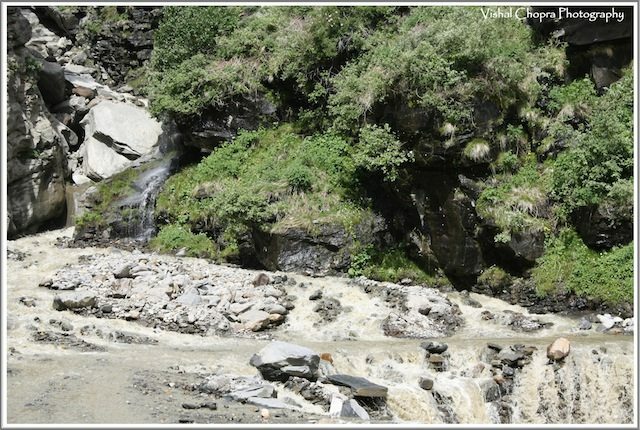 Dramatically things changed the moment we moved out of Keylong, Rain disappeared & visibility started improving on the road as if HE was testing our spirit & ability to take on challenges of higher degree which were yet to come during the day. We sailed through small villages like Gemur, Jispa & soon reached Darcha – A beautiful temporary camp site on River Bhaga. 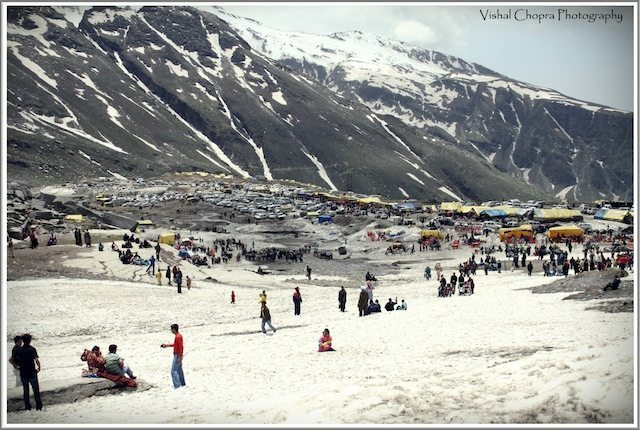 All travelers on Manali Leh highway need to register themselves here before proceeding further for Sarchu as this is the last recognized camp site in Himachal’s boundary & there after the challenges are thrown by the state of Jammu & Kashmir. Ride from Darcha to Sarchu is a pure bliss of bad roads, breathtaking landscapes and, of course, severe headache from AMS (Acute Mountain Sickness). To reach Sarchu, we had to cross Barlacha-La pass at 16,500 feet. 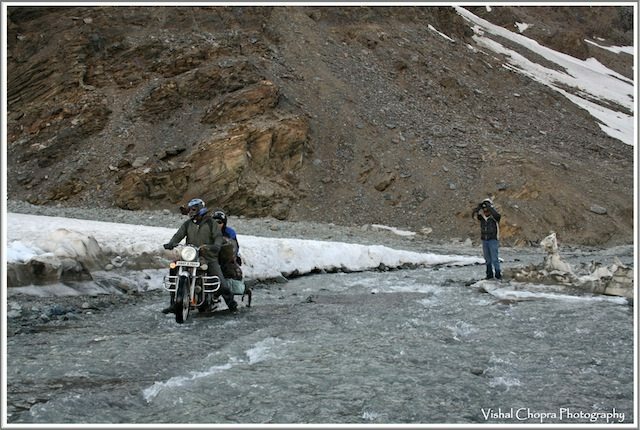 The roads had innumerable running streams with freezing cold water to offer but we were ready to take that challenge. As rightly said on the board “When going gets tough the tough gets going”. We were all curious to achieve the next target, Barlacha-La, which receives maximum snowfall due to its geographical positioning. Again the mist started to appear at Barlacha-La to shoot an advanced degree of difficulty, poor visibility and no or low oxygen at certain points. But, to boost up our spirits, the road at Barlacha-La was smooth as silk & we were more than happy to see that thick black line in the middle of white snow. 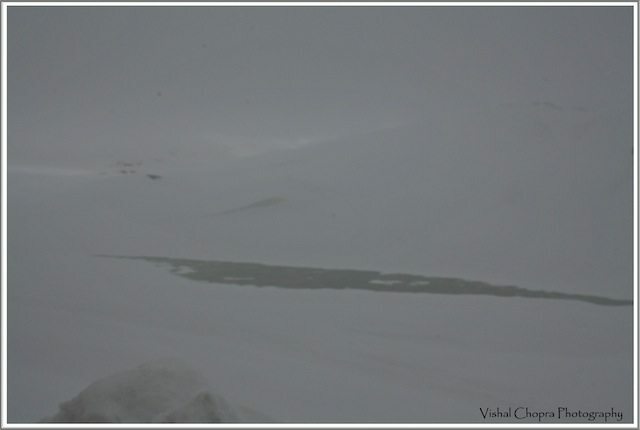 Suraj Taal, as you can see in the photograph below, was completely frozen. I am not sure about the temperature there but we stayed for around 25-30 mints. at Barlacha-La Top celebrating our undying spirit & achievement leaving behind other thoughts of time & place. We were all charged, motivated & confident to achieve the next 05 passes. After half-n-hour of celebration we started our downhill journey from Barlacha-La, this time along with the natural ice fencing on the road. It was a heavenly experience for all of us crossing Barlach-La with such breathtaking landscapes. 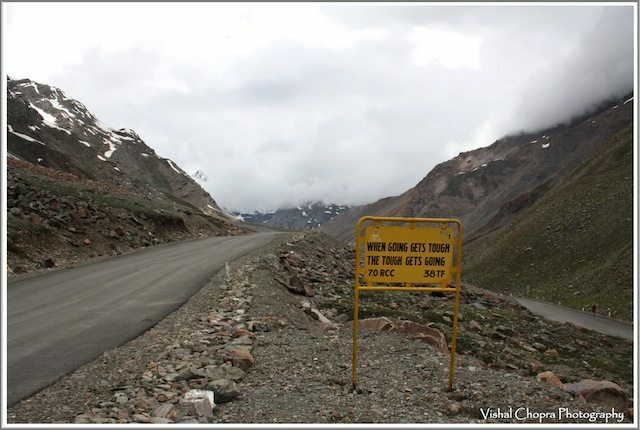 Challenges & more Challenges – the only thing one can expect on Manali – Leh highway. After crossing the heights of Barlacha-La we landed on an icy muddy terrain. This time our challenge was to cross an approx. 100 mtrs of a glacial stream. The flow was horrifying & the depth seemed endless. We all put-in our brains & tried our best to understand & analyze the flow & depth of that stream but failed as at each point it was full of surprises. To be honest I even thought of giving it up & was ready for camping on those glaciers in the middle of the snow caped mountains rather crossing that stream. It was like we had enough for the day. 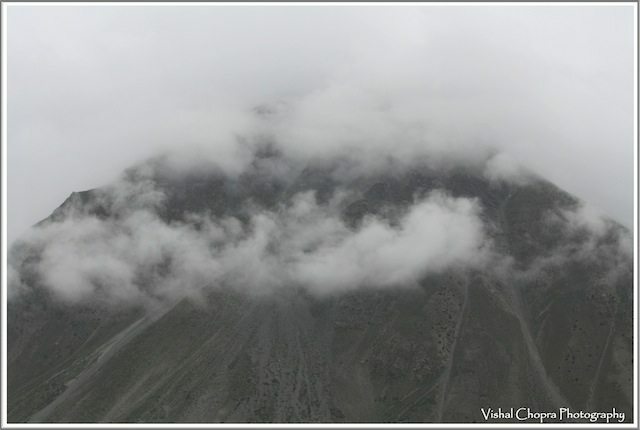 We were just 10-15 KMs away from our day’s target – Sarchu. 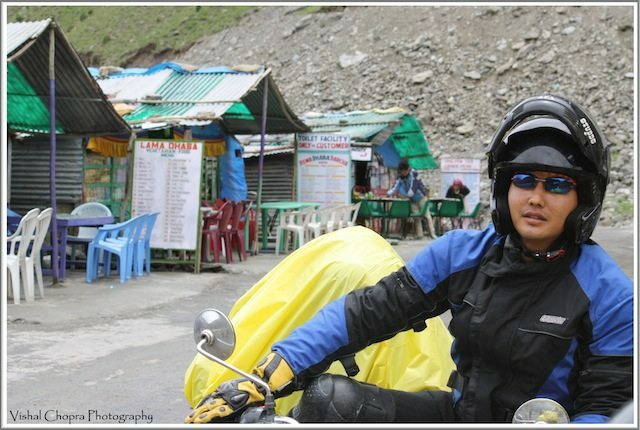 Once again the commendable efforts of our dear “Rambo Rawat” were applauded & appreciated by other bikers. Till this time none of us had the courage to enter that freezing cold water. We were three bikers on one side & there was a group of another three on the other side. 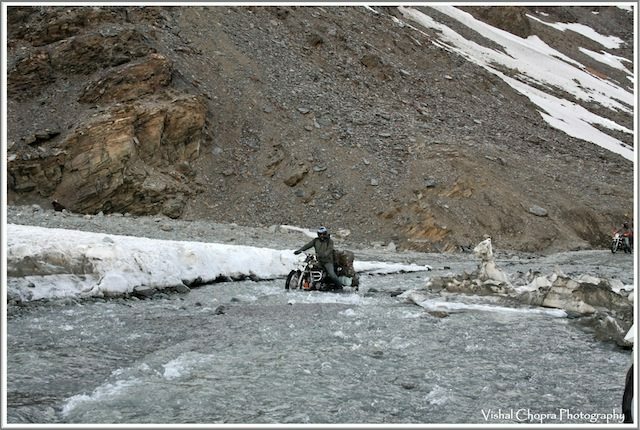 One of the bikers from the other side decided to start but got stuck in the middle of that freezing flow. All the other bikers of his group were busy removing their riding gears, shoes etc… for helping this poor chap out. Seeing this person in that difficult condition, without any second thought, our dearest Rambo Rawat “truly a Rambo in spirit” walked into that freezing strong current, which was almost at the knee height level, with all his gears on (including helmet), in his newly bought jeans & with the only pair of shoes he was carrying. He literally pushed his bike from the middle of that rivulet till the person reached safely at our end. By witnessing that exemplary efforts & spirit, truly speaking, we all got charged up. Other bikers also joined us ensuring that we all cross this hurdle safely. With combined efforts & team spirit we all managed to cross that stream. This entire exercise took around one-n-half hour, which drained out our energy & left us with heavy breaths & numb feet. We did our best what we could do to bring our feet back to senses but, It was like we had frozen veins. The sun was about to set & the winds were biting cold. With our dripping shoes & wet clothes we got back on our saddles & accelerated to our best to reach “Sarchu” without any further delay, as those guys informed us that we may miss the comforts of Dhaba tent at “Sarchu” in case we will reach a little late in the evening. We touched base with “Sarchu” by 18:00 Hrs which was a late arrival as per the standards of that beautiful desert. We were forced to pitch our tent in open. 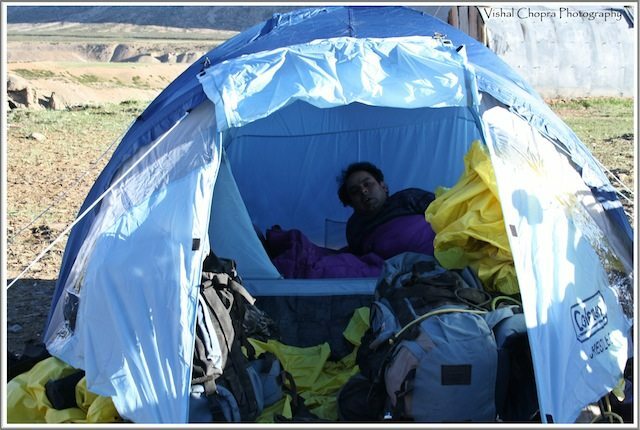 By the time I started putting up our tent AMS started showing its true colors on Surya. He encountered unbalanced heavy breath. I & Deepak were a little worried for his health but our “Rambo” maintained his calm & cracked a joke on Surya as we all were mentally prepared to handle this kind of situation. “Dubeyji theek ho to tent lagayen nahi to ghadda khoday”. We all had a good laugh at Surya’s expense. We were worn tired to do anything further & got straight away into our tent with our mats & sleeping bags, leaving behind the entire stuff on our bikes. It was difficult to catch some sleep in that condition. By 19:30 Hrs it was dark and Deepak proposed to had some dinner to which Surya responded “Humsey to na ho payega” & I also declined the proposal. We were dead tired & remember we had those numb feet. It was difficult for our Brains to convince our bodies to move out & have something. Again our “Rambo Rawat” did all the work for us. He was the one who unloaded the entire luggage from all the three bikes & put it safely in our tent’s extension. We were surprised to see his energy level. What a Man he is. We tried our best to relax & catch-up some sleep. I got up twice in the night & moved out due to my upset stomach, again a common feature of AMS. 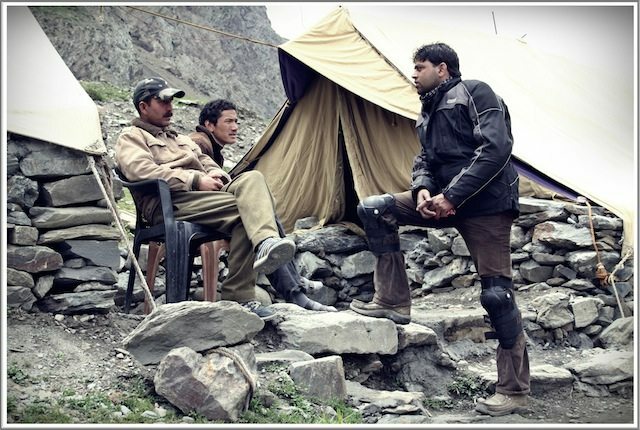 For that entire night our feet remained dead which made our survival all the more difficult in that terrain. 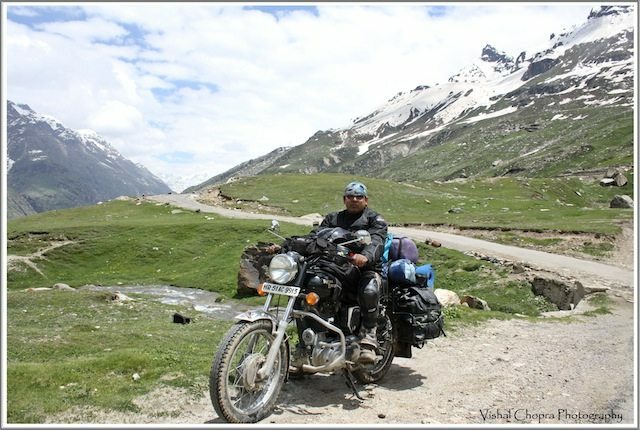 Ladakh Calling… (Part 2) – Manali to Sarchu was last modified: April 1st, 2013 by Vish. A traveler at heart and an adventure follower . A big bullet fan... gradually became a Rider. Apart from traveling and riding love to spend time with family, and enjoy with Kids at home. The adventure begins…wow, what a flow! Vishal bhai…kudos to you guys. Wonderfully presented, the captures are just awesome…just gets better & better as the log progresses…longing to keep my feet on this heavenly land soon…Thank you very much for sharing…eagerly waiting for the next part…. enjoyed the drive to Sarchu immensely. We did a drive till Keylong on this route . Going through your nice description brings back the memories. Good inputs about biking on these roads. Thanks Aurojit for spending time and reading through. 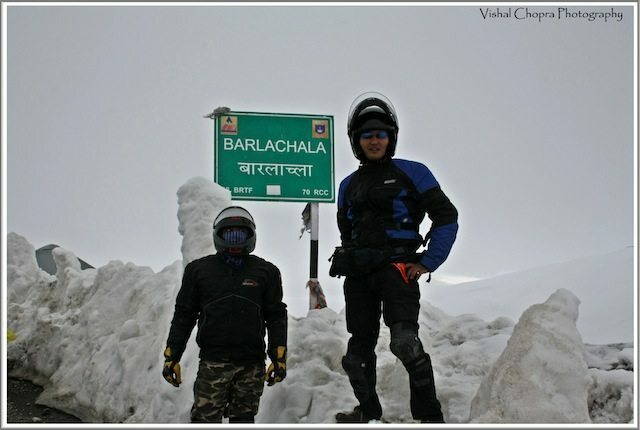 Yes Barlachala looks interesting in Pics now… but believe me when we were there it was not that easy to stay on at that height and in those conditions :) but yes we did it. 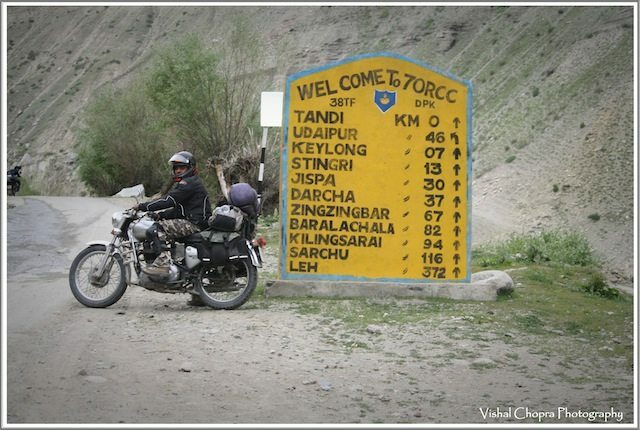 Manali to Sarchu is the part of Lahaul and Spiti, i have not covered. Awesome description with awesome pics. Like it. Vishal Paahji Same feeling is coming this time also but not sure whether i could make it or not this time. Please pray to the almighty so that I could come back to India for our hatrick Leh Ride. So Dubeyji finally you are here :) I Welcome you on behalf of all Ghumakkars . I would definitely like to keep U, Rambo and Pahhji in every ride to Ladakh. This is real adventure. Great going, Vishal. I was visualizing the journey while reading it. Supported by great photographs. Terrific post, Vish. One thrilling journey. Hail Rambo ! Thanks Venkatt for your comments and spending time on our log. Yes it was a thrilling journey. No doubt. Thanks Venkatt for your comments and spending time on our log. Yes it was a thrilling journey n o doubt. Really a great & adventures post. What a energy in rambo rawat………. great. Pics are awesome. Ya Saurabh “Rambo Rawat” is our energy bank :) Thanks for all the appreciation… other parts will be coming in soon. Superb post with spectacular pics of stunning snow scapes. It must be even better than this in reality, I expect. Thanks Gita for reading through. Yes you are absolutely right it was a life time experience for all of us. What an experience!!!! you have made every ghumakkar part of your this fabulous and most exciting journey. This is certainly a lifetime experience….you all carry the true ghumakkari attitude without getting too much into detailing just face the present and forget the rest. The entire episode seems to be watching the “Man Vs.Wild” series, no word is enough to praise the bravery, presence of mind and real manliness shown by M/s.Deepak and Rambo in every crunch moments. Fortunate to have such reliable nad adjustable co travellers.Your highly skill full narration will encourage many of our adventurist ghumakker to take mission Leh through the same route. Keep encouring, excited and informed through such post, would love to follow the entire series. Very Nicely Explained. Awesome pictures buddy!! I hope I could make it to this place once in my life time. 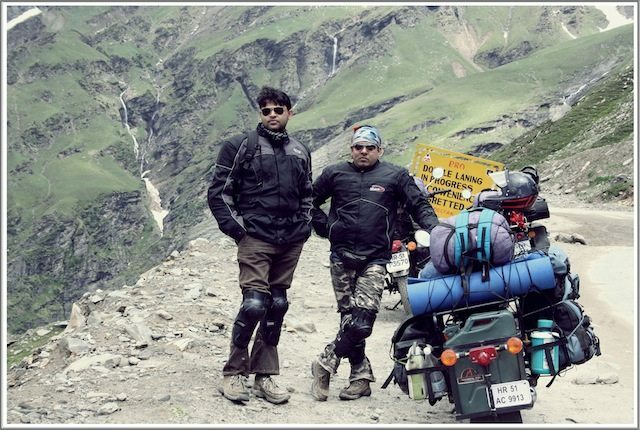 Thanks a lot Biswajit Ganguly ji (Mr. BG) “Bera Grylls” :) :) for all the praise and for liking this trip log. Thanks once again and stay glued for the coming posts. Wow. 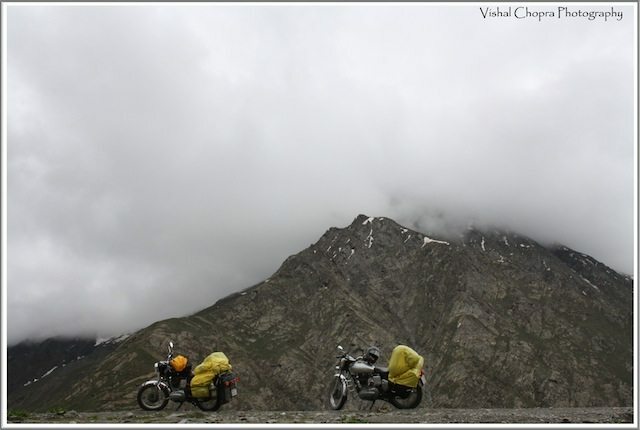 There are so many, simple so many, stories of ride to Leh but each one makes you feel different . The pics of Barlacha-La is amazing. 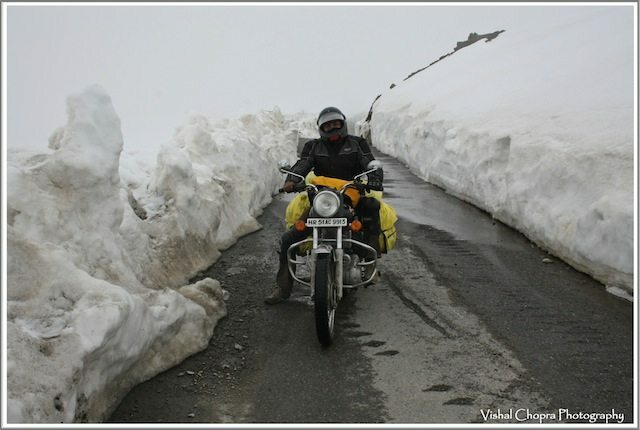 I think June is the right time to go to Leh because come July or Aug, all these snow columns would just go away. 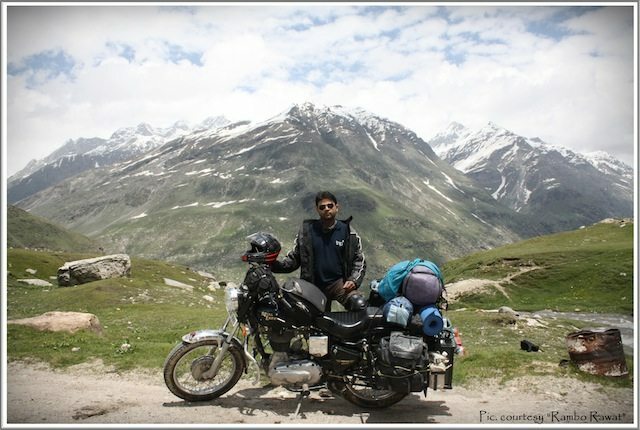 I have done Kaza-Manali via Kunzum pass in June first week and it was worse. The circuit is not critical from security angle so no one cares to put a tar there :-) unlike here where there is enough attention. Never been to Leh. Some day, for sure. A few days back, Anoop’s log also talked about tough-stay at Pang, (less of AMS, more of closed-confines of an ill-ventilated dhaba. I guess you guys started a bit late from Keylong (the nallas also grow in intensity as the day matures). 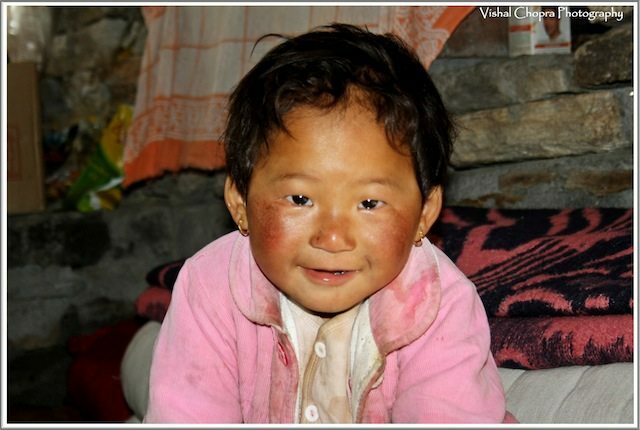 If one can start early from Keylong, is there a way to avoid stopping at Sarchu ? Looking forward to next part, Vish. 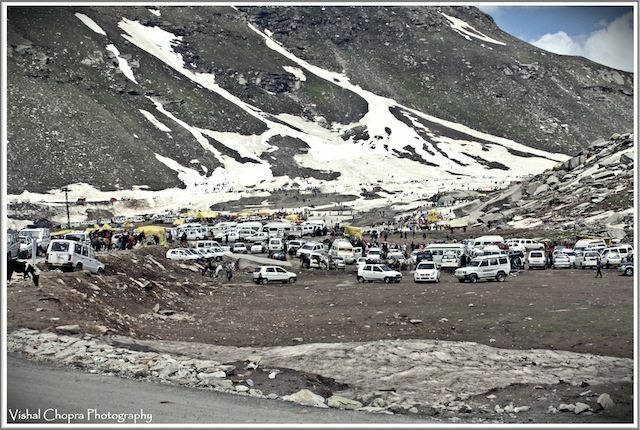 You are rite dear, “Rohtang and Jams” complement each other not because of difficulty level and bad road conditions but due to huge tourist footfall. 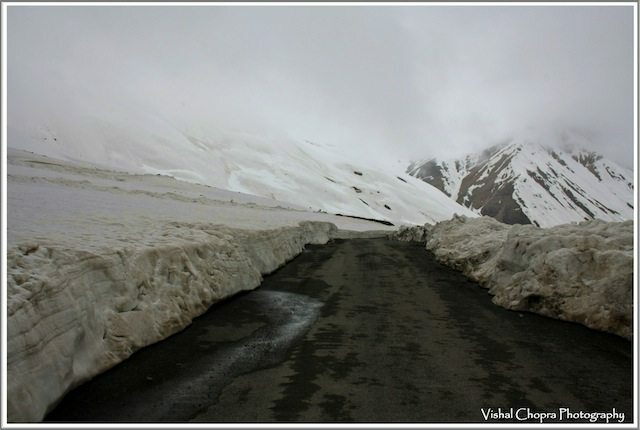 June is the time when the road gets open for public n tourists… July and Aug. are no doubt the comfortable months for ride but the monsoon hits by that time and people try to avoid riding in rains for sheer reason of landslides and slippery roads… but if anyone wants to see snow and is ready to take on such a challenge as we did that preparation is a must… I have seen many riders on the way struggling and looking for help due to lack of knowledge or experience or may be they were never prepared for this ride. Now that we have lot of knowledge and experience sharing from all Ghumakkars for this particular ride. I hope our comments and posts will add value for the those who are planning to take it head on. One thing which have mentioned in my trip log is “Ladkah is different everyday” no matter how early you start or little late one can never ever predict about the route, the weather and of course day’s target. One has to pend a night either at “Sarchu” or at “Pang”. Night halt at Sarchu is comparatively less difficult than Pang. 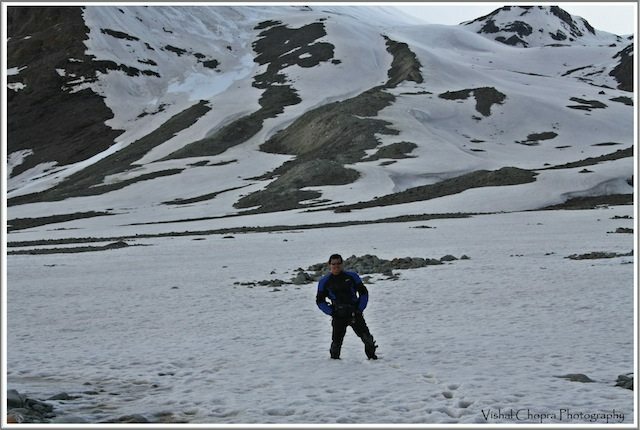 People generally make this mistake of taking a halt at Pang coz people always want to reach Leh as soon as possible… which was not the case with us :) we had sufficient time in hand and were giving our bodies all the time for acclimatization which people generally forget to do. While reading, i was feeling as if i was travelling in those beautiful mountains and terrains. Very well described by you. And hats off to “Rambo rawat”. I thoroughly enjoyed your experience in paradise on earth. Keep up the good work man…. Thanks Mr. Ved for reading the posts and liking it. I wish to inquire what is the road conditions in july there…I wish to go there with my family…wife + 2 kids…and planning to hire a taxi from delhi …is it safe in first week of july ? I am only worried about Road conditions. Hiring a taxi from Delhi is ok if your family can adjust with so much of travel. with my experience of doing ladakh 4 times now I suggest to take a flight from Delhi to Leh and hire a taxi there. We can talk about it in more detail as you finalize your mode and route. Hope my concerns will help u in deciding. Thanks Vishal for quick response ,I am planning in july because my daughter has to join her Ist job in aug.so she wish to visit before that…even now we need to move in Mid June as her joining is expected in july..and we are planning thru srinagar,sonmarg kargil route…secondly wish to know…is it safe to visit with 2 ladies ?? if you can suggest…rates of cab from jammu ?? Paahji Ladakh Calling again this year. Getting there is not easy and that’s the best part. It was a clear day with sun rays warming our bodies that have gone numb due to the chill in the air. High snow clad peaks bordered with Golden oak and deodar kissing the deep blue sky above, welcomed us to Auli. A look at the place and all our tiredness of long journey through zig zag roads, landslides and pilgrims traffic is gone.